Delray Beach, FL – August 9, 2018 – The 70-unit 111 First Delray condominium in the SofA (South of Atlantic) District of downtown Delray Beach, has closed on a $20.6 million loan to fund the completion of the building, currently under construction at 111 SE First Avenue, just one block south of Atlantic. The loan, provided by Trez Forman Capital Group, is a strong vote of confidence in the project’s solid success to date. 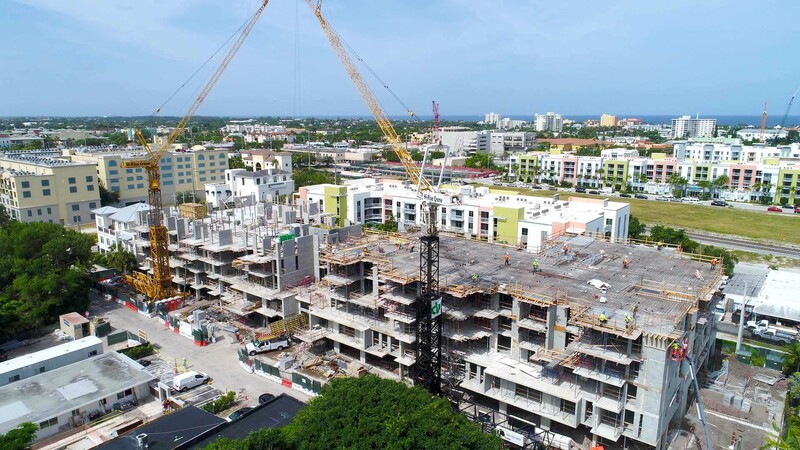 Since sales began in 2016, the 111 First Delray condominium has sold 60% of its units to a variety of buyers from local, out of state and international markets. The property, located at 111 SE 1st Avenue, one block south of famed Atlantic Avenue, sits on a 1.12-acre parcel and will bring contemporary urban living to downtown Delray Beach. 111 First Delray is meticulously designed to provide today’s perfect upscale lifestyle, where you can live, work, and play all at the same prestigious address. Downtown Delray Beach, long known for its eclectic community and vibrant atmosphere, has transformed into a cultural mecca, making it the perfect place to explore the heart and soul of a burgeoning art scene, historic downtown, and open-air marketplace, among other attractions. The 70-unit Delray condominium gives residents access to modern design and upscale appeal with floor plans ranging from one, two, and three-bedroom units. All units include luxurious standard features such as Bosch appliances, wood-look Spanish porcelain plank flooring, quartz countertops, the latest smart-home technology and security, private balconies (select units offer private roof decks), lightning fast internet and private storage space. Lifestyle amenities are impressive, ranging from a 5th-floor, state-of-the-art gym overlooking the pool to the beautifully landscaped recreation and pool deck featuring poolside cabanas, a covered, open-air lounge area with poolside summer kitchen, bar, televisions and billiards table. Additional features include private gated parking, secure bicycle storage, electric car charging stations, pet-friendliness, low HOA fees and more. SOFA Partners, the developer of the 111 First Delray condominium, is led by two father-son teams, Manuel and Felipe Vergara, and Rafael and Daniel Rincon. Collectively, the Vergaras and Rincons have over 70 years of development experience in Colombia across a comprehensive range of asset classes including residential, office, and retail. To ensure the success of the project, SOFA Partners has assembled an all-star team of professionals including George Ligeti of The Greenfield Group and Paul Kilgallon of Mainstreet Capital Partners. Each brings an extensive array of business acumen and general management experience to the table, as well as a thorough knowledge of the construction industry in South Florida. Further sourcing the best talent, SOFA has contracted with Richard Jones Architecture and Carrie Leigh Designs, two award-winning boutique firms known for their ability to enhance common living spaces through high-quality design. Current Builders is the general contractor, with over 40 years in business and a ranking of 9th largest residential contractor in Florida. Nestler Poletto Sotheby’s International Realty, the region’s preeminent residential brokerage firm, known for representing only the most exclusive properties, is leading the sales efforts. With prices starting in the $500,000s and a host of amenities and lifestyle luxuries, 111 First Delray appeals to a wide variety of people who have at least one thing in common: an appreciation for South Florida living at its finest. Completion is expected in early 2019. Your future home awaits. For more information about SOFA Partners and 111 First Delray floor plans, click here. © 2019 SOFA Partners | View Legal Disclaimer | Marketing by LGD Communications, Inc.